Nokia Point and Find – the results ! Of all the people in the test city with a compatible handset, 3% downloaded the app. The average number of app users interacting with any given ad campaign was 23%. Video clips were consistently popular regardless of advertiser product category. Google have announced another acquisition, a company called Plink. Under their ‘visual search’ header which includes Google goggles, Plink art is a mobile application which scrutinizes pictures of well-known paintings and artworks, and identifies them. Competitors to this product include Snap Now and Nokia’s Point and Find. Passers-by to the Selfridges store in London’s Oxford Street can try on a range of Tissot watches by wearing a paper wristband and holding it in front of an augmented reality installation in the store window. Shoppers are able to “try on” 28 different watches from the Swiss watch maker Tissot, and can also experiment with different dials and straps. The paper wristbands were distributed outside the store. ‘Diesel-Cam’ is an interactive installation that allows shoppers to photograph themselves and post the pictures immediately to their Facebook profiles. Their friends can then offer advice on which garments they should by or they can show off their new purchases. 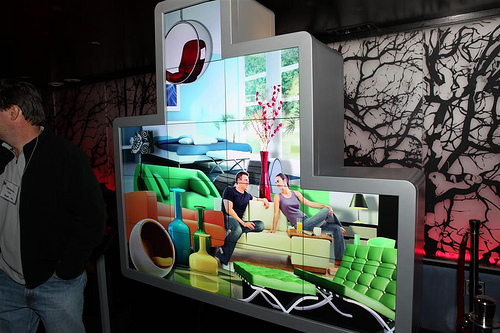 MicroTiles™ are modular, digital display tiles that can be stacked and clustered liked building blocks to create a digital canvas of any size, any shape and in any space. 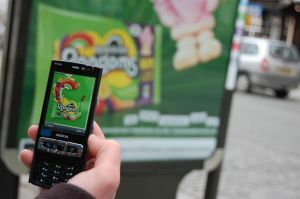 Product launch events have been relatively high profile over the last few months but we are yet to see an OOH ad campaign that takes advantage of the technology which is particularly impressive when viewed in real life. “3D video mapping” building projections (where animations are created based on the specific features of the the building & are distorted to allow a perfect match to the surface contours) have been around for years now but have experienced a recent surge in popularity. Whilst there is still plenty of scope for creative originality I wonder how long it will be before clients or agencies deem it ‘not new enough’. At the same time there is increased scrutiny from the authorities over such activity & concerns from clients regarding legal liabilities, however the application below potentially overcomes all of these. The technology is the same, but a bespoke 3D sculptural installation replaces a building as the projection surface enabling a longer term, more interesting display in an outdoor locations. 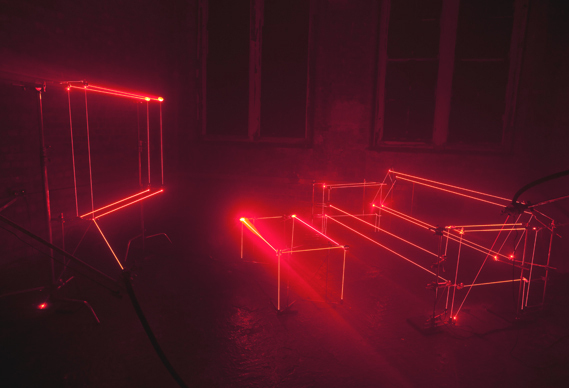 Wandering through the four storeys labyrinthine of the Bargehouse, the exhibition forces consumers to interact with the laser and light installation taking them on a sensory journey where they are asked to explore the nature of speed, efficiency, communication and modernity. More details at creative review.